For other uses, see Common good (disambiguation). In philosophy, economics, and political science, the common good (also commonwealth, common weal or general welfare) refers to either what is shared and beneficial for all or most members of a given community, or alternatively, what is achieved by citizenship, collective action, and active participation in the realm of politics and public service. The concept of the common good differs significantly among philosophical doctrines. Early conceptions of the common good were set out by Ancient Greek philosophers, including Aristotle and Plato. One understanding of the common good rooted in Aristotle's philosophy remains in common usage today, referring to what one contemporary scholar calls the "good proper to, and attainable only by, the community, yet individually shared by its members." The concept of common good developed through the work of political theorists, moral philosophers, and public economists, including Thomas Aquinas, Niccolò Machiavelli, John Locke, Jean-Jacques Rousseau, James Madison, Adam Smith, Karl Marx, John Stuart Mill, John Maynard Keynes, John Rawls, and many other thinkers. In contemporary economic theory, a common good is any good which is rivalrous yet non-excludable, while the common good, by contrast, arises in the subfield of welfare economics and refers to the outcome of a social welfare function. Such a social welfare function, in turn, would be rooted in a moral theory of the good (such as utilitarianism). Social choice theory aims to understand processes by which the common good may or may not be realized in societies through the study of collective decision rules. And public choice theory applies microeconomic methodology to the study of political science in order to explain how private interests affect political activities and outcomes. During the 15th and 16th centuries, the common good was one of several important themes of political thought in Renaissance Florence. The thought goes back to Thomas Aquinas theory of common good being virulent in whole premodern Europe. In a later work, Niccolo Machiavelli speaks of the bene commune (common good) or comune utilità (common utility), which refers to the general well-being of a community as a whole, however he mentions this term only 19 times throughout his works. In key passages of the Discourses on Livy, he indicates that "the common good (comune utilità) . . . is drawn from a free way of life (vivere libero)" but is not identical with it. Elsewhere in the Discourses, freedom, safety and dignity are explicitly stated to be elements of the common good and some form of property and family life are also implied. Furthermore, the common good brought by freedom includes wealth, economic prosperity, security, enjoyment and good life. It is important to note, however, that though Machiavelli speaks of an instrumental relationship between freedom and common good, the general well-being is not precisely identical with political freedom: elsewhere in the Discourses, Machiavelli argues that an impressive level of common good can be achieved by sufficiently good autocratic rulers. Nevertheless, Machiavelli's common good can be viewed as acting for the good of the majority, even if that means to harm others through the endeavor. 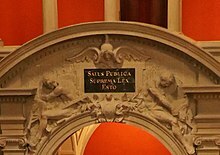 Salus publica suprema lex esto, "The common good is the supreme law", in the Swiss Parliament. The concept is strongly present in Augustine of Hippo's magnum opus City of God. Book XIX of this, the main locus of Augustine's normative political thought, is focused on the question, 'Is the good life social?' In other words, 'Is human wellbeing found in the good of the whole society, the common good?' Chapters 5–17 of Book XIX address this question. Augustine's emphatic answer is yes (see start of chap. 5). The Compendium later gives statements that communicate what can be seen as a partly different sense of the concept – as not only "social conditions" that enable persons to reach fulfilment, but as the end of goal of human life. "[T]he common good [is] the good of all people and of the whole person… The human person cannot find fulfilment in himself, that is, apart from the fact that he exists "with" others and "for" others" (#165; italics original). "The goal of life in society is in fact the historically attainable common good" (#168). ^ a b Lee, Simon. "Common good". Encyclopædia Britannica. Encyclopædia Britannica. Retrieved 9 March 2016. ^ a b Dupré, Louis (5 August 2009). "The Common Good and the Open Society". The Review of Politics. 55 (04): 687. doi:10.1017/S0034670500018052. ^ Diggs, B. J. (1973-01-01). "The Common Good as Reason for Political Action". Ethics. 83 (4): 283. doi:10.1086/291887. JSTOR 2379966. ^ Aristotle. Politics. pp. 3, 6–7, 12. ^ Aquinas, Thomas. Summa Theologiae. pp. 1, 2. 90. 2 and 4. ^ Locke, John. Second Treatise of Government. pp. 131, 158. ^ Hume, David. Teatise 3, 2. 2. ^ Publius. Federalist. pp. 10, 51. ^ Rousseau, Jean-Jacques. Social Contract. pp. 2. 1. ^ a b c Diggs, B. J. (1973-01-01). "The Common Good as Reason for Political Action". Ethics. 83 (4): 283–284. doi:10.1086/291887. JSTOR 2379966. ^ a b Simm, Kadri (16 August 2011). "The Concepts of Common Good and Public Interest: From Plato to Biobanking". Cambridge Quarterly of Healthcare Ethics. 20 (04): 555. doi:10.1017/S0963180111000296. ^ Plato (2003). Republic. London: Penguin Books. pp. 462a–b. ^ Diggs, B. J. (1973-01-01). "The Common Good as Reason for Political Action". Ethics. 83 (4): 283–293. doi:10.1086/291887. JSTOR 2379966. ^ Aristotle. Nicomachean Ethics [Internet]. The Internet Classics Archive; available at http://classics.mit.edu/Aristotle/nicomachaen.html. I.2.1094b7–10 (last accessed 30 Jan 2011). ^ a b Clayton, Edward. "Aristotle: Politics". Internet Encyclopedia of Philosophy. ^ a b c d e f Waldemar, Hanasz (2010). "The common good in Machiavelli". History of Political Thought. 31 (1): 57–85. ^ Discourses, I 16, p. 174. ^ Discourses, I 2, p. 132;Discourses, I 9, p. 154. ^ a b c Mark Skousen. "It All Started with Adam". ^ "Confucian Political Philosophy – Oxford Handbooks". doi:10.1093/oxfordhb/9780199238804.001.0001/oxfordhb-9780199238804-e-48. ^ Bloom, Irene (2009) (trans.). Mencius. New York: Columbia University Press. ^ a b c Bulliet, R. & Bowering, G. & Cook, D. & Crone, P. & Kadi, W. & Euben, R. L..The Princeton Encyclopedia of Islamic Political Thought. Princeton: Princeton University Press, 2012. ^ Roemer, John E. (1996). Theories of Distributive Justice. Cambridge: Harvard University Press. ^ Axelrod, Robert (1984). The Evolution of Cooperation. New York: Basic Books. ^ Smith, Adam (1776). The Wealth of Nations. ^ Pigou, Arthur (1920). Economics of Welfare. London: Macmillan and Co.
^ Arrow, Kenneth (1951). Social Choice and Individual Values. New York: John Wiley & Sons. ^ Gibbard, Allan (1973). "Manipulation of voting schemes: A general result". Econometrica. 41 (4): 587–601. doi:10.2307/1914083. ^ Satterthwaite, Mark Allen (1975). "Strategy-proofness and Arrow's conditions: Existence and correspondence theorems for voting procedures and social welfare functions". Journal of Economic Theory. 10 (2): 187–217. doi:10.1016/0022-0531(75)90050-2. ^ Riker, William (1982). Liberalism Against Populism: A Confrontation Between the Theory of Democracy and the Theory of Social Choice. Long Grove, IL: Waveland Press. p. 137. ^ Sen, Amartya (1966). "A Possibility Theorem on Majority Decisions". Econometrica. 34: 491–499. doi:10.2307/1909947. ^ Mackie, Gerry (2004). Democracy Defended. Cambridge: Cambridge University Press. ^ Olson, Mancur (1965). The Logic of Collective Action. Cambridge: Harvard University Press. ^ Downs, Anthony (1957). An Economic Theory of Democracy. New York: Harper and Row. ^ Ostrom, Elinor (1990). Governing the Commons: The Evolution of Institutions for Collective Action. Cambridge: Cambridge University Press. ^ Elster, Jon (2002). "The Market and the Forum: Three Varieties of Political Theory". Philosophy and Democracy. Oxford: Oxford University Press. ^ Landemore, Hélène (2012). Democratic Reason: Politics, Collective Intelligence, and the Rule of the Many. Princeton: Princeton University Press. ^ Epistle of Barnabas[permanent dead link], 4, 10. ^ "Radical Academy". Radicalacademy.com. Archived from the original on 2011-07-17. Retrieved 2013-10-03. ^ "Common Good Forum". Commongood-forum.org. Archived from the original on 2013-10-04. Retrieved 2013-10-03. ^ UNESCO (2015). Rethinking Education: Towards a global common good? (PDF). UNESCO. pp. 80–81. ISBN 978-92-3-100088-1.